We're not making promises, but there wouldn't normally be a Jaguar convertible without a coupe version lurking somewhere in the future. Stay tuned to our Los Angeles auto show coverage for more as it develops. The 2014 Jaguar F-Type revives the E-Type's sportscar formula without bowing down to its design ethos--and lives up to the promise of sports car fun in a luxurious environment. Jaguar's first return to the true sports car market since the legendary E-Type, the 2014 F-Type bears a heavy burden in living up to its lineage. Fortunately, the F-Type impresses with its performance, not just its pedigree. Slotting in just below the XK Roadster and Coupe in the Jaguar range in size and performance, the F-Type nevertheless overlaps the larger XK range slightly in price at its upper end. Drawing its design and ethos from Jaguar's legendary D-Type and E-Type, the F-Type manages to spurn any purely retro nods, favoring instead a modern take on the proportions, balance, and essential Jaguar-ness of those classics. As chief designer Ian Callum put it, "this car is for now." 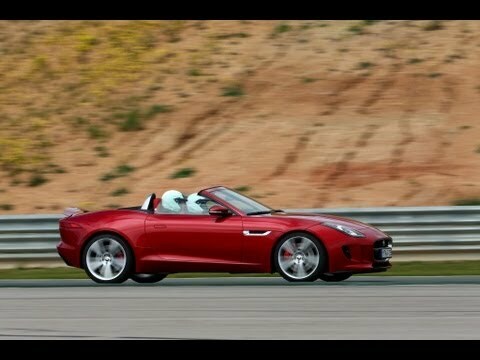 Available only as a roadster for the time being (though a hardtop coupe is in the works), the F-Type presents a uniquely British balance of performance, style, luxury, and comfort--and, in V8 S form, one of the best exhaust notes on offer. The link to the XK is clear, but the F-Type clearly progresses beyond that smoother shape. The F-Type has a relatively tall front end with a large grille opening flanked by dual air intakes and capped by upsized, upswept headlamps, underlined in LED lighting. There's enough Corvette and Maserati influence to go around, especially at those intakes--Callum refers to them as "gills." 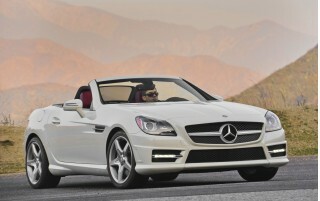 The hood's a clamshell design--it's another heritage influence that also helps crash safety. The shape grows sleeker along its shoulder line and along the decklid, where thin baguette-shaped LED taillamps--the thinnest possible, he says--bulge at one end with circular insets that directly refer to the E-Type. The design's at its best from the sideview, where there's just enough overall length to let the muscular suggestiveness play out over surfaces and shoulder lines and door skins unbroken by door handles--they're hidden, popping up from flush by a touch of the fob or a finger. It's a touch Jaguar's kin at Aston Martin might appreciate. Or, not. The cockpit's a more intensely focused environment than in the XK. The driver steps into a cockpit with a hooded binnacle of gauges, while the passenger gets a grab handle--a tacit message about the real mission at hand here. Much of the ancillary information will continue to be displayed on a big LCD screen, but climate controls are back to prominent positions on the stack as rotary knobs with push functions for seat heating. Subtle cues drive home the sportscar message: drivers get a different grade of trim on their part of the IP, and on the more powerful versions the start button, shift paddles and sport-mode switch are marked in diving-watch orange. A flat-bottomed steering wheel will be on the options list, too. The six-cylinders are 3.0-liter units, one tuned to 340 horsepower and 332 pound-feet of torque; it's shared with other Jaguar products, including the XJ and XF sedans for the 2013 model year. In 380-hp tune, it's a distinct version held aside strictly for the F-Type. The 0-60 mph estimates for these models are 5.1 seconds and 4.8 seconds, respectively, and top speeds are limited to 161 mph and 171 mph. The V-8 is an evolution of the current 5.0-liter unit, with 495 horsepower, and 460 pound-feet of torque. It's pegged at a 0-60 mph time of 4.2 seconds, with a top speed limited to 186 mph. An eight-speed automatic transmission with rev matching and paddle-shift controls is the only transmission available--for now, Jaguar officials hint. Unlike the latest models from the marque, the F-Type doesn't sport a rotary shift control--it has a conventional shift lever that, if anything, preserves the packaging for a true manual transmission. All powertrains have direct injection and stop/start systems. Active exhaust is standard on the two higher-performance models, and optional on the 340-hp F-Type. The more powerful V-6 gets a mechanical limited-slip differential; the V-8 gets an electronically controlled version for maximum traction. The latter two models have launch-control modes for fault-free acceleration runs. Behind the wheel, the F-Type lives up to its sports car design intent, though its relatively heavy curb weight and slightly numb steering feel reveal the compromises made to reach Jaguar levels of comfort and luxury. Like the XK, the F-Type's body structure is made from aluminum. 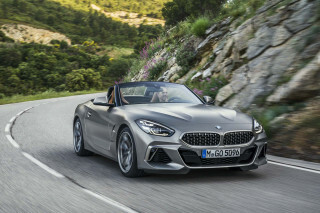 It's large for the cars it'll be priced against in the U.S.--Boxster, Z4, SLK--and while it's 176 inches long, with a 103.2-inch wheelbase, it's also a wide-tracker at 64.1 inches at the rear. In the end, the structure's more about optimal weight balance and immediate responsiveness than weight loss, and that goes for the suspension--independent all around, also formed from aluminum. The electronics are there, but as a supporting act: a sport mode quickens throttle response, weight up the steering, speed up shifts, and delay the onset of stability control. Step it up a notch, and an adaptive suspension on the two high-performance models offers driver-configurable setup, as a whole or system by system--you're able to choose a faster throttle response while keeping light steering weight and a comfort-oriented ride, for example. You're also able to measure g-forces through a track-time recorder that displays your performance on the LCD screen. Braking comes via standard 13.9-inch front and 12.8-inch rear brakes; mid-range F-Types get 15-inch rotors in front, while the V-8 model has 14.8-inch rear rotors. Aerodynamic aids include an active rear spoiler that deploys at 60 mph and folds flush at 40 mph, and a front air splitter. Finally, luxury features haven't been left off the sportscar's menu just to save a few ounces--not if the well-heeled buyer wants them. Power sport seats have manual fore/aft adjustments to save weight, but upgraded "Performance" seats are an option, as is full power adjustment. Audio systems come from Meridian, with either 10 or 12 speakers, and either 380 or 770 watts of power. 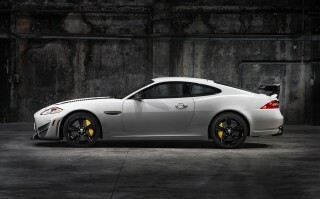 The 2014 Jaguar F-Type goes on sale in the U.S. in May 2013. The base 340-hp supercharged V-6 model will be priced from around $69,000; the 380-hp supercharged six, from around $81,000; and the V-8 sportscar, from about $92,000. Stunningly formed, the 2014 Jaguar F-Type manages to evoke the past without kneeling before it. The F-Type's shape takes the modern Jaguar language found in the XK to a new level: smooth, flowing, and taut, the lines of the F-Type recall hints at classic Jags while the details and overall effect is completely modern. A relatively tall front end, large grille opening flanked by air intake scoops, and upswept headlamps underlined with LEDs give the nose of the F-Type a sharp, aggressive look--and a bit of Maserati or Corvette flavor as well. A clamshell hood gives a nod to the past while also boosting crash safety. A continuous line traces from the nose of the car along the front fender and door, trailing off as it arcs into the rear fender, where a new, overlapping line takes up and runs over the wheel to the tail. On the doors, there are no handles to mar the F-Type's flow; instead they pop out of the doors at an angle with a push of the key fob (or a finger). Inside, the F-Type's style is more focused and, as Ian Callum calls it, mechanical, than the XK's. Not wanting to put on a tacky homage to the past, there is no wood in the interior trim--just as in the E-Type, though it did get a wood-rimmed wheel. A large, central LCD screen displays most of the information, backed up with an informative screen between the analog gauges in the instrument panel. Three multi-purpose knobs below the screen handle climate control and seat heating. Descending alongside the screen and center stack controls is an extra passenger grab handle--a plain cue to the F-Type's sporting nature. Other subtle cues also mark out the differences in the driver's space: slightly different trim around the instrument panel, orange-accented start/shift/and sport mode switchgear on some models; and an optional flat-bottom steering wheel. A wide range of design packages is available, with colored stitching, seats, and more. Quick, agile, and glorious to hear, the 2014 Jaguar F-Type is a true sports car--but we could do with a bit more steering feel. Despite the F-Type's substantial curb weight (for the sports car class), its reflexes are sharp, grip is high, and balance is impeccable. Not as hard-edged as some alternatives, the F-Type manages a keen balance between satisfying performance driving and occupant comfort. While the base engine is strong, it's a touch less potent in the lower half of the rpm range than we'd like. The F-Type S's 380 horsepower fills in that gap, while maintaining the base model's responsive feel. The V8 S is incredible fun--accelerating at full power produces smiles not just from the brisk acceleration but from the sound of the big engine as it roars up the gears and crackles back down them. The Quickshift automatic changes gears quickly, but in our experience with the car, there's a delay between the driver's request of the shift (whether by paddle or lever) that takes some getting used to. Left to its own devices, the transmission picks, and even holds, the right gear admirably, however the F-Type is driven. All powertrains have direct injection and stop/start systems. Active exhaust is standard on the two higher-performance models, and optional on the 340-hp F-Type. The more powerful V-6 gets a mechanical limited-slip differential; the V-8 gets an electronically controlled version for maximum traction. The latter two models will have launch-control modes for fault-free acceleration runs. Weight savings of a few hundred pounds keep the 3,500-pound F-Type trimmer than the XK, though it shares its bonded and riveted body structure with that four-seater. Some inner, unstressed panels are formed from even lighter composite materials. In the end, the structure's more about optimal weight balance and immediate responsiveness than weight loss, and that goes for the suspension--independent all around, also formed from aluminum. The electronics are there, but as a supporting act: a sport mode will quicken throttle response, weight up the steering, speed up shifts, and delay the onset of stability control. Step it up a notch, and an adaptive suspension on the two high-performance models offers driver-configurable control, as a whole or system by system--you're be able to choose a faster throttle response while keeping light steering weight and a comfort-oriented ride, for example. You'll also be able to measure g-forces through a track-time recorder that displays your performance on the LCD screen. The 2014 Jagaur F-Type's interior is beautifully made, but a tiny trunk limits weekend getaway luggage. The Jaguar F-Type is a two-seater--no package shelves masquerading as back seat nubs here. Those seats are fairly spacious in every regard except leg room; the passenger gets shorted several inches versus the driver, and neither is abundant, though only drivers over the six-foot mark will likely notice. Aside from that one shortfall, the interior of the F-Type is quite comfortable. With the top up, all is quiet and calm. Lower the top, and wind intrusion is minimal until you begin to approach triple-digit speeds. Worth noting are the optional fully power-adjustable seats. With a smart sport design and adjustable pneumatic bolsters, the seats are very good at holding the driver and passenger in place--and they look rather smart, too. The F-Type's trunk is minimal, even by sports car standards--the tiny Mazda MX-5 Miata offers more space. The seven cubic feet in the F-Type's trunk are arranged in a thin layer, making it difficult to fit even medium-sized bags. No crash tests have been conducted, but the F-Type's rigid structure and standard safety equipment give us confidence. Neither the NHTSA (National Highway Traffic Safety Administration) nor the IIHS (Insurance Institute for Highway Safety) have crash tested the 2014 Jaguar F-Type, which is typical for cars of its price and volume class. Despite the lack of a rating, the F-Type's aluminum chassis is build to be rigid, it hosts a full compliment of airbags, and its sheer agility makes it responsive in an emergency maneuver. Safety technology includes blind spot monitoring, reverse traffic detection (with Vision Pack), automatic speed limiter, and the usual traction and stability control, anti-lock brakes, brake assist, as well as cornering brake control. 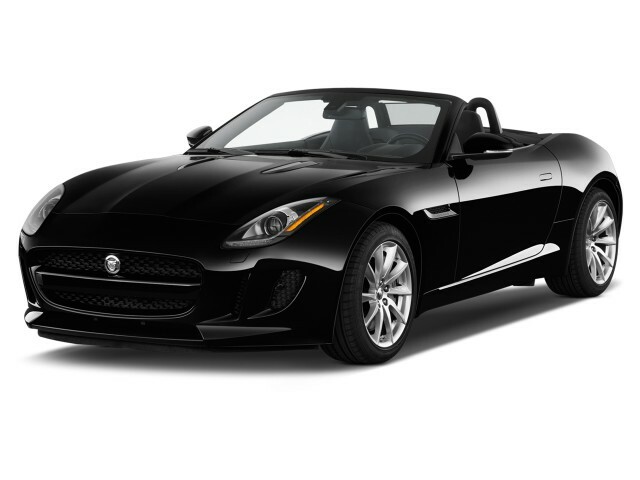 Highly configurable, from nicely equipped to fully loaded, the 2014 Jaguar F-Type offers a balance for everyone. In the case of the F-Type's balance between svelte sports car minimalism and high-tech luxury, the balance tips to the side of comfort. Audio systems will come from Meridian, with either 10 or 12 speakers, and either 380 or 770 watts of power. 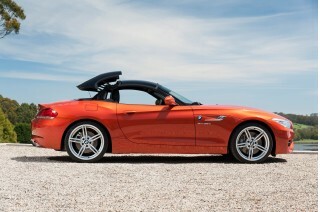 At the F-Type's entry price point ($69,895), it's a well-equipped, fairly quick sports car. 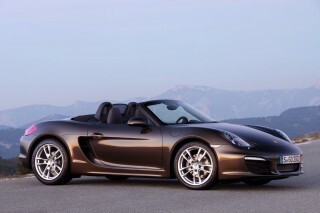 Around the mid-range ($85,000-$95,000) it tends toward greater performance and greater luxury. 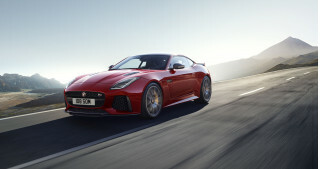 The most personalized and high-performance models, ranging as high as $110,000 with a full equipment set, offer a uniquely Jaguar sensibility, making the most of the F-Type's balance between civility and speed. .
EPA figures aren't yet in, but Jaguar's mileage estimates for the F-Type are on the upper end of the sports car spectrum. The EPA rates the base supercharged V-6 Jaguar F-Type at 20 mpg city, 28 mpg highway, and 23 mpg combined, making it a fairly economical offering at this level of luxury and performance. The sportier supercharged F-Type V6 S drops only one mile per gallon on each count, scoring EPA ratings of 19/27/22 mpg city/highway/combined, despite gaining 40 horsepower. The powerhouse of the F-Type family is the V8 S, rated at 495 horsepower from its supercharged V-8; accordingly it's the least efficient, scoring just 16 mpg city, 23 mpg highway, and 18 mpg combined. It's not super-thirsty for its performance level, but it won't win you any Earth-loving friends, either.